Pork makes a tasty dinner meal and there are so many recipes for this meat. Pork and paprika is a simple to make recipe and it is easy to alter the amount of spices so that it appeals to all members of the family. Paprika is one of the most fiery of hot spices and should be used with caution if you are not used to it. If you are not familiar with this spice perhaps halve the amount in the recipe the first time that you make Pork and Paprika. Spices should always be cooked with the meat to bring out their flavour and not added to the stock. This is a meal that can be cooked slowly in the oven or a slow cooker. With very little preparation time you can easily put this in the oven to cook whilst out at business or with the family. It is a recipe that will cook beautifully if left alone for several hours. 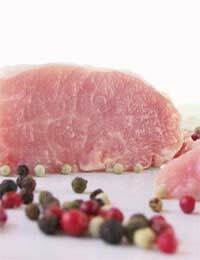 Alternatively you can prepare it within one hour for your dinner if you use good quality tender pork fillet cut into smaller bite size pieces. Although the recipe calls for pork fillet you can easily use any pork meat even spare rib chops left whole are suitable for a dinner meal. Add the oil to the pan and when hot put in the sliced onions and fry until a very light brown.At this point add the diced pork fillet and cook until all sides are sealed.Add the paprika and lightly stir to coat the meat and onion for several minutes.Next add the tomato paste and crumbled stock cube followed by enough water to cover the meat. Leave to simmer on a low heat for thirty minutes.At this point you can transfer the meat to an oven proof dish, cover and place in a low oven or slow cooker so simmer for several hours.Next, add the crème fraiche and parsley and cook for a further three minutes. This meal is ideally served for dinner with simple accompaniments that will not compete with the strong flavour of the paprika. Fluffy mashed potato or perhaps white rice, there again a baked jacket potato with the pork and paprika poured over the top will serve as a more casual television dinner. Although vegetables will not do too well if added to this meal chick peas, tomatoes or beans do go well if replacing some of the liquid from the recipe. This makes an interesting and unusual dinner meal that is easily prepared. Even a tin of baked beans seem to suit this meal and can be appealing to the younger members of the family when you are introducing them to different flavours.